This classic Indian dish comes from Nidhi Raghav, the very gifted and lovely foodie maven of Platter Joy, who loves the cuisine of every culture and course. The motive of her recipe blog at platterjoy.com “is to help you make the kitchen the most beautiful corner of your home, where happiness is made and served.” When happiness is on Nidhi’s menu, everyone takes a seat at her table. Ask a North Indian about Chana Masala and all you will hear is “mmmm”. This vegetarian dish is a hot favorite of many of us. We team it up with rice, paratha, rotis, naans, bhatures, and possibly everything. 1. Soak the chickpeas in water overnight. Rinse, then boil with 1 teaspoon salt for about 30 minutes, or until they turn soft. (Many would say that boiling with salt may increase the cooking time but I haven’t experienced that so far. They cook well and the salt seasons the chickpeas, which makes them taste better than those without salt.) After the chickpeas are boiled, drain and set aside. 2. Heat oil in a pan over medium heat. Add the cumin seeds, bay leaves, cinnamon sticks, cloves, and cardamom seeds; cook until they turn golden brown. Now add the diced onions and cook until they turn soft. Now, in goes the ginger-garlic paste and let it cook for about 2 to 3 minutes. 3. After this, add the coriander, black pepper, turmeric, and the red chili powder. Stir for a minute and then add the tomatoes. Lower the heat and let the spices cook in the tomatoes for about 10 minutes. Cover the pan with the lid and keep stirring in between at an interval of 2 minutes for even cooking. 4. Now, after the spices are well cooked, add the boiled chickpeas and a little salt to suit your taste. Mix well and the Chana Masala is ready to be served. I avoid adding water to it as the onions and tomatoes blend well during cooking and give it a great texture. Serve hot with paranthas, Indian breads, naans, or anything of your choice. Garnish with coriander leaves or mint leaves. © 2015 PlatterJoy. All Rights Reserved. Kukla’s first love affair was with Greek food but she was also a huge fan of non-Greek culinary styles—as long as they met her delectable standards. She enjoyed watching the Food Network with Joanne’s stepson Danny when he was little, and her favorite TV chef was Lidia Bastianich on PBS—both Kukla and Lidia had a free hand with food…no cups or spoons needed! Their eyes did the measuring. In Kouzina EXTRA! we’ll report on our food adventures and news—sometimes Greek, sometimes not…but always delicious! Our focus today is on the new Chef’s Table at REIN at The Garden City Hotel (Garden City, NY). One evening a month, chef Michael Mandato and his staff prepare a stellar 5-course dinner served in the hotel’s main “kouzina” (kitchen). 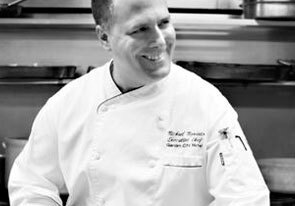 Chef Mandato highlights seasonal, locally-sourced ingredients, including fresh summertime tomatoes and herbs from the hotel’s garden, as well as cheeses and produce from east-end Long Island farms like Catapano and Goodale. For vegetarians, vegans and those with food allergies, the chef is happy to creatively, and deliciously, customize each course to diners' needs. Up close and personal (in the kitchen) is the perfect way to watch the action while experiencing the smells and tastes of each dish as it develops and makes its way from the stovetop and oven to your table. A wine pairing for each course complements the presentation, making this an event to be savored in all its stages. Following a generous hors d’oeuvres (coconut shrimp in green gazpacho, tuna tartar, duck dumplings) and champagne (Veuve Clicquot-Brut NV) introduction, we were seated and watched the elaborate menu unfold. Ready to have your own deliciously intimate dining experience? Details for the next Chef’s Table menu on May 28 can be found on gardencityhotel.com. Call REIN at The Garden City Hotel at 516-877-9385 to make a reservation. Seating is limited so claiming your place at the Table should be done sooner rather than later.  Subscribe on our Contact Us page and we'll put you on our email list for Kukla's Kouzina updates. Did you enjoy our EXTRA blog? Please send us your comments below! Thanks for following us. Keep checking back to see when our next Kouzina EXTRA pops up! Copyright © 2013-2015 Kukla's Kouzina: A Gourmet Journey~Greek Island Style / Kouzina EXTRA / The Naked Truth About...Greek Cooking! In Kouzina EXTRA! we’ll report on our food adventures and news—sometimes Greek, sometimes not—but always delicious!